Boxes perfect for pressure-sensitive or liquid foodstuffs as tomatoes, salad, soups etc. The canisters can be re-used frequently. The material of the canisters is robust, and the lids are made of ABS-plastics. 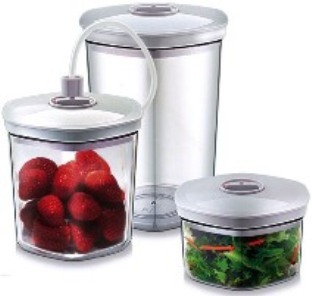 They are break-proof and dishwasher safe, suitable for all CASO vacuum sealers, stackable and space-saving.